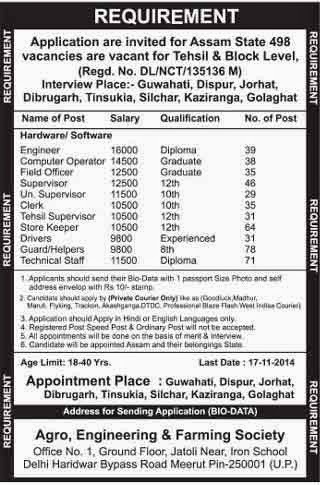 Interview Place: Guwahati, Dispur, Jorhat, Dibrugarh, Tinsukia, Silchar, Kaziranga, Golaghat. Applications should send their Bio-Data with 1 passport size photo and self addressed envelope with Rs. 10/- stamp. Registered post speed post & ordinary post will not be accepted. All appointments will done on the basis if merit & Interview. Age: 18 to 40 Yrs.